Mix walnuts with 2 tbsp honey and the Golden Syrup (warm the syrup and honey first to make it a little easier) and a sprinkle of sea salt. Bake on a greaseproof paper-line baking tray at 190C for eight minutes, then take it out and leave to cool. When cool, break up into individual nuts. Cut each pear into six wedges, removing the core. Brush with the remaining honey and a pinch of sea salt. Place on baking tray and bake at 180C for ten minutes. 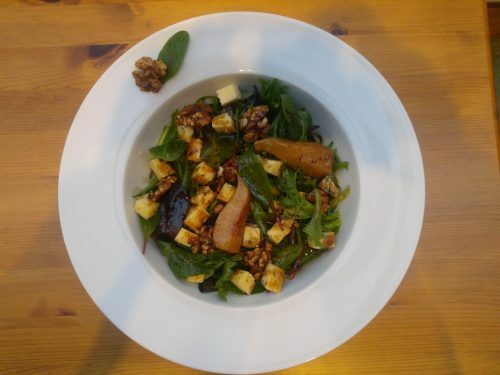 Toss together the salad leaves, baked pears, Darling Blue, walnuts. Drizzle with the dressing. Andy and Kathy’s comment: This is so delicious you don’t want the meal to end. Michael and Mary Davenport had a decision to make: give up farming or find some way of adding value to their milk.